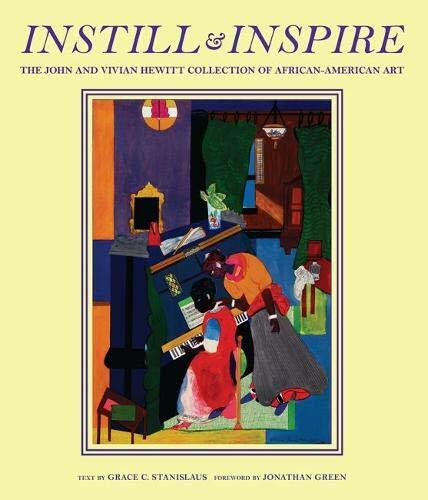 The Instill and Inspire volume is a comprehensive presentation of works lovingly and intentionally brought together by an African American couple, for African American artists, on behalf of African American history, society, and culture. Stanislaus welcomes the reader into the collection by describing the African American art scene in the U.S. during the second half of the 20th century—or lack thereof. She pinpoints “fear, fascination, repulsion, and entrancement,” in the relationship between blacks and whites on all levels—economic, political, social—as well as in their art, culture, beliefs, rituals, and traditions. Whites controlled the black art world and market as much as they controlled every other aspect of black life. Enter John and Vivian Hewitt. As a professional educator (John) and librarian (Vivian) they were an active part of the well-educated and socially conscientious black middle class. They started collecting art in 1949 while on a trip and added pieces regularly for 50 years. They sought to debunk the white art patronage system and replace it with a black version for black artists. Not only did they buy art, they sought to promote the artists themselves. By opening their home and inviting the community to partake in their personal passions, they extended hospitality, friendship, and support into the heart of the art world—they fed the artists themselves. Full color print reproductions fill the bulk of this project. Lined up in alphabetical order the reader is treated to artists such as Charles Alston, Romare Bearden, John Biggers, Ernest Crichlow, Jonathan Green, Alvin Hollingsworth, Hale Woodruff, and a dozen or so others. Closing out the book are essays from other African American art collectors, giving their own reasons for why the next generation should continue to support the arts. One of the main themes that circulates through each of these essays is how necessary and important it is, when collecting art, for the collector to make a point of learning about the artist. What inspires their work? What motivates them? What techniques do they choose and why? What is the story behind the piece? This information is critical; it serves as the glue that binds the artist to the collector. While it is good for these essayists to state their encouragement, it seems that Stanislaus did not heed their advice. As beautiful as the images are, there is nothing written about why the Hewitts selected a particular artwork. What drew them to it? What was the lure? What was their relationship with the artist? What was the story of that piece? What made it an integral part of their overall collection decisions? There is little information offered in this regard, and this information is sorely missed. Another theme that is meant to be motivating is the oft-repeated quote from Mrs. Hewitt that the couple bought because, “Art was cheap and we could afford it.” One might now, however, find this statement intimidating because there is nothing about their chosen artists that is still affordable for the casual collector. An original painting by the famous muralist Hale Woodruff (1900–1980), for example, can run in the tens of thousands. The Hewitt collection holds four Woodruffs. Even though the Hewitts’ artists are now priced out of the common person’s definition of “cheap,” the message remains reasonable: art gives healing, pride, courage, and strength; it enhances, enriches, and expands life. There are plenty of artistic niches waiting to be discovered. People should find something they love, bring it into their space, and let it continue to instill these characteristics into their beings as inspirations for their soul. What is good for the enthusiastic collector is good for the artistic community and benefits society at large.